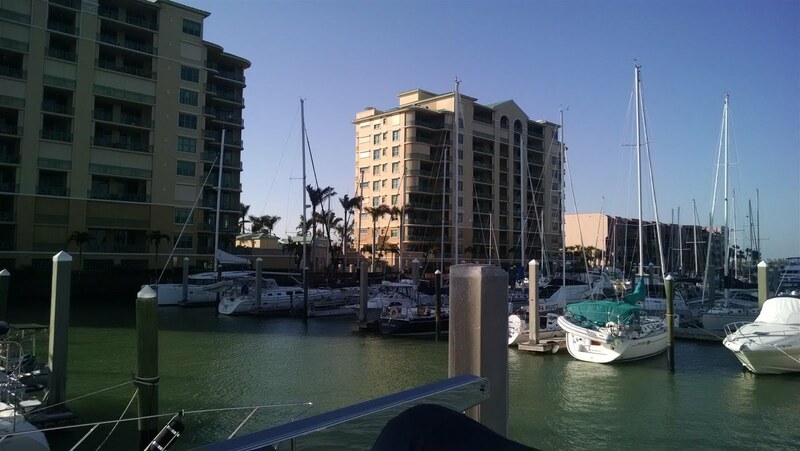 Before departing Legacy Harbour and Fort Myers we wanted to be confident that we had (a) an adequate supply of maintenance-related spares parts and (b) a full load of other provisions, including basic household supplies as well as food. So while Rick focused on supplies of fuel & oil filters, impellers, pumps, belts and that sort of thing, Chelle zeroed in on her “hotel load” spreadsheet requirements. Amazon and the local Publix loved her. Wouldn't Fit in the Holes. Drilling Out with a Titanium Drill Bit Fixed That. In the course of that order-and-wait process Rick also got a few minor maintenance items tended to, including replacing an erratic digital ammeter (related to alternator output) on the pilot house DC electrical panel, drilling out bigger holes in a recalcitrant deck plate, and replacing a GFCI outlet that went wonky back in the cockpit area. 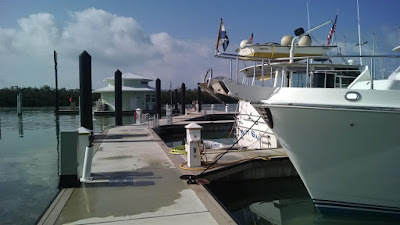 Then, shortly after we had completed the sea trial for the dinghy we also took it for a spin up to the Fort Myers Yacht Basin to top it off (along with our spare fuel cans) with non-ethanol gas; that hopefully will sustain us for the upcoming weeks in the Bahamas. Rick also did the same thing with our two propane gas tanks, being certain we had sufficient cooking fuel for the foreseeable future. Final preparations included installing safety latches for the refrigerator and freezer doors, and then changing out the Racor primary fuel filters for the main and wing engines as well as the generator. As usual we found sufficient distractions to give us some breaks from boat duties and trip preparations. Legacy Harbor Marina throws an annual “Boater Appreciation Party” where they provide lots of free food and drinks, along with live entertainment on their large party deck. It’s their way of thanking the long-term winter “residents” that make up the bulk of their annual revenues. And yeah, it’s good marketing, too. And, just a few days before we were planning to depart we finally got the chance to host Jim and Susan Hill aboard the boat, returning all the great hospitality they had shown us the last few months. We had a nice happy hour on board and then enjoyed a very good pizza at Capone’s in downtown Fort Myer’s riverfront district. 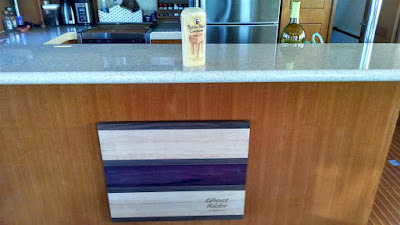 Lastly, we spent a little time mounting a unique and beautiful “Purple Heart” cutting board – a gift from daughter Suzanne – in the salon area. 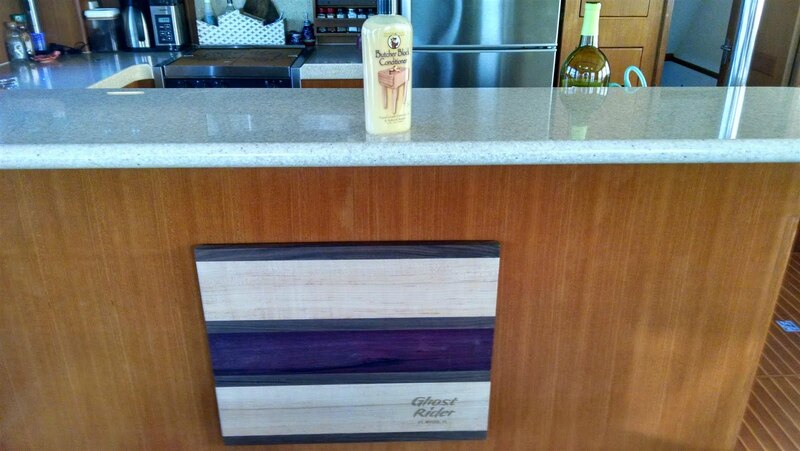 Pictured to the left you’ll note the center strip of purplish wood that comes from the Purple Heart tree in the Brazilian rain forest. You can read about the lumber HERE but it’s a plentiful tree and an amazingly durable wood. And the Purple Heart motif holds special meaning for our family. While it is now mounted quite sturdily to survive rough sea conditions, it can also be easily removed for practical use in the galley, too. 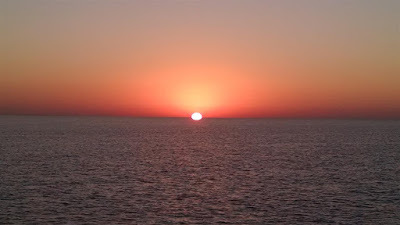 On the morning of Tuesday 13-MAR we made a final check of the weather and found it good enough to go, and by 0930 we were underway and headed south towards Marco Island, our first planned stop. While our winter months in Fort Myers were enjoyable and productive, it was good to be on the move once again. The weather forecast called for relatively cool but clear conditions with winds around 15K from the northwest, and that’s pretty much what we got. That also gave us a 3 foot following swell but at comfortable intervals and only a light wind chop on top, so it was a good ride with ground speed averaging just over 8 knots. We had planned to stay at the Factory Bay marina for two nights but extended it to three due to an unexpected repair need (yes, another surprise.) We had noticed a pretty good water leak (visually as well as per the bilge pump counter) in the forward bow thruster compartment, and it tasted pretty salty, so it became a priority to track down. Eventually we traced it to the anchor locker, which is just forward and above the bow thruster area. We had to dump a few hundred feet of anchor chain on the bottom of the marina to inspect and gain access to the bottom of that locker, and there we found a partially blocked drain hole and an encased hose run whose caulking had cracked and aged well beyond its point of effectiveness – giving water an easier path to inside the boat vs. the thru-hull drain. 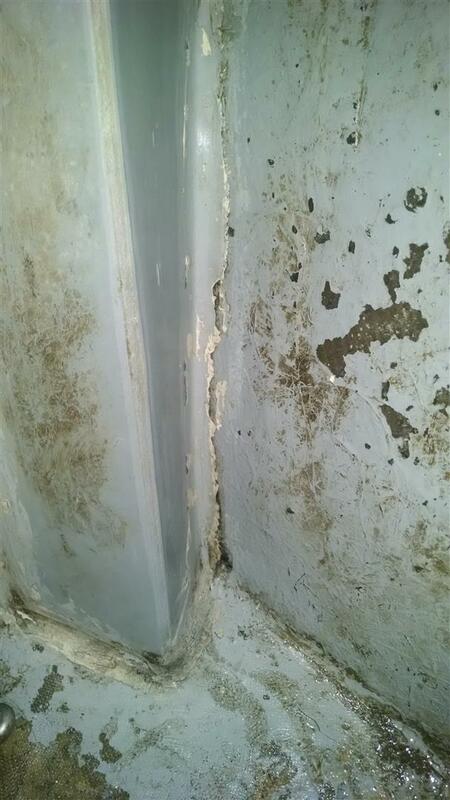 Rick cleaned all that up and then applied liberal beads of Rescue Bond XL1 Pro (super caulk!) That had to cure 18 to 24 hours before we could cover it again with all that chain, thus the extra night’s stay. Once it had set Rick also covered the caulking seams with protective strips of 100MPH tape (see footnote below) and then we retrieved the chain the afternoon of 15-MAR. We also found several deck bolts in that locker that were fairly loose and leaking water into that compartment from above, so we also tightened those, although eventually we would need to completely remove and re-bed those. While hanging out at Factory Bay we took the opportunity to make the short walk to one of our favorite eateries, Old Marco Pub, for dinner on our second night – the seafood is fresh and the steaks are tender, juicy and tasty there. 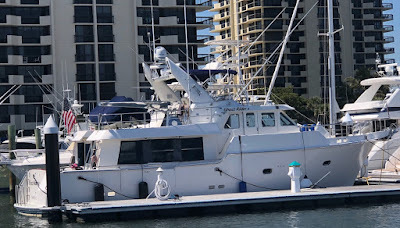 And as often happens in the cruising world we made some new friends – Mark and Sandy Holtsclaw pulled into the marina and docked right off our bow in their 42’ Kadey-Krogen, Karissa Leigh. They hail from Michigan and are enjoying cruising in the relative warmth of south Florida this winter. We toured each other’s boats and enjoyed back-to-back happy hour sessions in the process. We had yet another good forecast for our Friday departure and by 1000 we sortied away from the dock, made our way through Gordon Pass and then pointed Ghost Rider south, initially towards the mouth of the Shark River where we had planned to anchor. 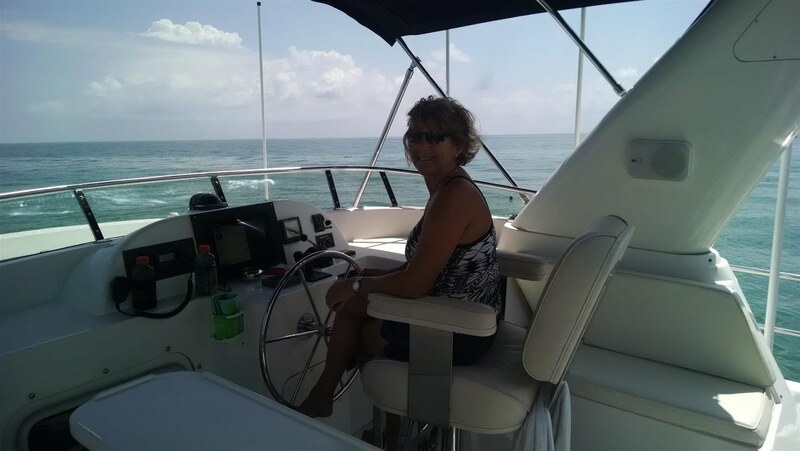 But the conditions were so good – temps eventually got to 75F, seas were very tame, and we were seeing ground speeds on the GPS between 8 and 9 knots – that we decided to press further south to Cape Sable. 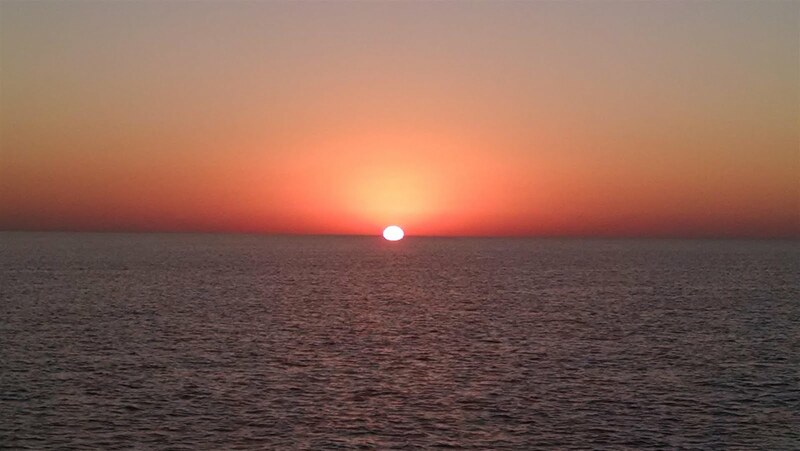 We had noticed an anchorage review in that area (via Active Captain) that was very positive for the anticipated conditions there – a light southeast breeze and flat water. By 1800 we had dropped the anchor in about 9 feet of water about 600 meters from the shoreline, right at the southwestern-most edge of the Cape, and set the anchor alarm. There was not another boat or soul in sight throughout the night, and at this point we were “off the grid” – there is no cellular service there. The sunset was spectacular as was the stargazing that followed…the near total lack of light pollution gave us unhindered views of numerous celestial features (thank you Google Sky Map). 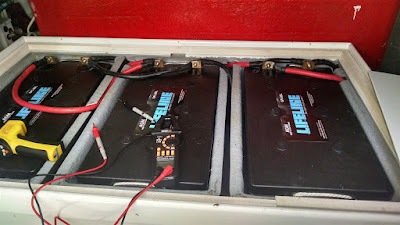 We turned off the genset and went with fresh air ventilation overnight (with screens….there are bugs that will eat you here in Everglades National Park even in March), and were pleased to see the house battery bank only down to 88% capacity the next morning. As for “boat business” (see further below) we still have a water leak in the forward thruster compartment, although at a slower rate and different location; that will get more investigation later, likely after we dock up in Fort Lauderdale later in the week. We fired up the generator the next morning to charge up the batteries (it took two hours to get them back to 97%, which is acceptable.) We had a lazy morning on the hook as there was no rush to depart….it would be less than a 5 hour sortie to Marathon and we wanted to wait for a higher tide since at this point we only had about a half foot of water under the keel at low tide. By 1100 we had retrieved the anchor and were motoring south at around 8 knots. Weather was perfect, with temps in the 70’s, light breezes from the SE, and flat seas….an excellent St. Patty’s day in the subtropics. While enroute we tested our reverse osmosis water maker – that would be a no-go item for a Bahamas sortie if it wasn’t fully operational – and over a two hour span we confirmed the unit will produce about 28 gallons of fresh water with excellent quality; so we were quite pleased with that. (However: Rick learned a lesson about opening the correct water manifold valves, e.g., do that before you crank up the water maker unless you want copious amounts of RO product water on the engine room floor around the fresh water manifold.) Apart from that exercise the day’s journey was pleasant and mostly about dodging the numerous crab pots that dot the seascape in these latitudes this time of year. 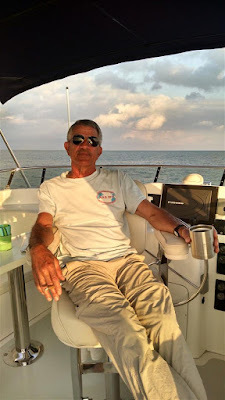 After passing under the Seven Mile Bridge (with a quick following current giving us 9 knots even at a reduced throttle) Rick steered Ghost Rider into Marathon’s Boot Key Harbor and the Marathon Marina just after 1500. Their new floating docks are quite nice, by the way, and it looks as if they’ve recovered from Hurricane Irma damage quite nicely. Coming in at low tide was a tad unnerving as the harbor’s entrance channel has some serious shoaling on the south side, but we hugged the green markers (north side) and kept the keel off the bottom. We waited for high tide before departing the next morning (around 1030) and that made our exit through the harbor’s channel a lot less stressful than the entrance the previous day. We also should compliment Marathon Marina on the width of its main fairway – maneuvering in and out of our slip was straightforward. We steered Ghost Rider south to get around the Boot Key land mass and once clear of that then turned her east to head up Hawk Channel in the general direction of Key Largo, where we planned to anchor on the inside of Rodriguez Key. The ride up the channel was delightful….smooth water, mild temps nearing 80F, and the crab pots weren’t as numerous as the previous two days, with only occasional evasive action required. 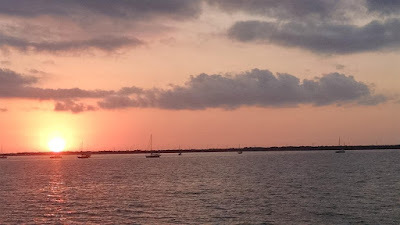 When we arrived at Rodriguez Key the anchorage on the northwest side of the island looked like a parking lot….we counted 12 boats, all sail, already anchored when we arrived just after 1700. But there was still plenty of room for us to find a good spot with more than adequate swing room, and the depth – even arriving at low tide – was good. We dropped the hook, set it hard, and enjoyed another wonderful evening at anchor. While it was a peaceful night the next morning we were a bit disturbed by our house battery readings. While SOC was solid at 87% after inverting off the batts overnight, the voltage seemed mighty low at 12.1 volts. We didn’t have time to troubleshoot at that point, so we just fired up the generator and let it charge the house bank for the next 3 hours, and let the alternators take over from there. We wanted to be underway by 0830, but when we said we had set the anchor hard, we weren’t kidding. Judging by the amount of sand, mud and shells that was seemingly glued to the topside of our anchor once we had spooled it to the boat, we were thinking we should have had a dredging permit. But Rick eventually got the anchor cleaned and stowed, and Chelle drove us out of the anchorage, pointing us north on our planned route to Fort Lauderdale. Initially seas were mostly calm, and once again we were blessed with excellent weather, allowing us to spend most of the day at the fly bridge helm. We also were now far enough north (relatively speaking) that the crab pot dodging was drastically reduced, making use of the “navigation mode” of the autopilot much more practical. But later in the afternoon the winds and seas picked up; while waves were only 2 to 3 footers quartering on the starboard stern, they were at 2 second intervals and pushing the boat around. The ride was smooth enough, but the autopilot struggled with holding the programmed headings, yawing +/- 10 degrees. That wasn’t a big deal until it was time for our WOT (wide open throttle) run as we got close to Fort Lauderdale at the end of the sortie. After Rick firewalled the throttle he turned the helm over to Chelle and was headed down to the engine room to make the usual WOT checks. That’s when a bigger wave hit Ghost Rider from the rear tossing the boat’s bow to the starboard quite a bit, and the autopilot went bonkers, throwing the rudder into a hard-over starboard turn. It’s actually pretty amazing how fast a Nordhavn 50 can snap into a 180 degree end swap ends…in seconds we were suddenly headed south instead of north. We immediately throttled back and simultaneously disengaged the autopilot to regain control, but it was disconcerting. Rick made visual checks of the rudder post, steering ram and autopilot pump / plumbing, but found all in order. He also then made another short WOT run with manual steering and found nothing amiss. So from what we can tell at this point it was an autopilot computer screw-up, and we’ll change our WOT procedures in sloppy following seas going forward. Full displacement trawlers aren’t intended to be amusement park rides. 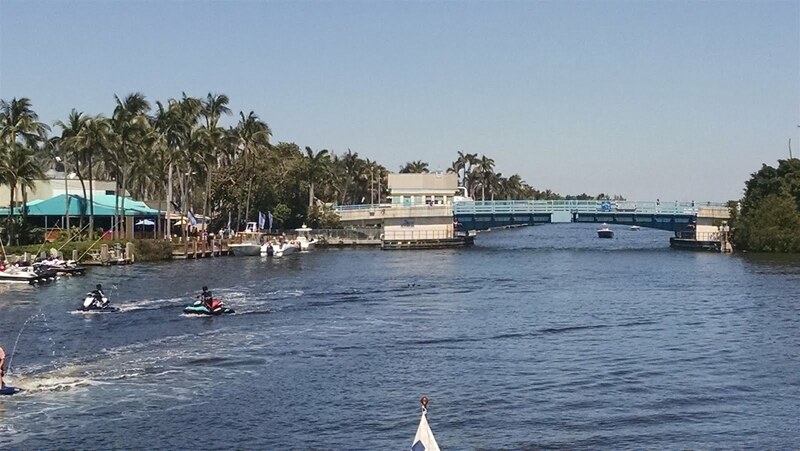 Of course we had the same sloppy seas as we entered the Fort Lauderdale (Port Everglades) entrance channel; Rick manually steered Ghost Rider from the fly bridge, and it would have been mostly uneventful except for all the other boats doing stupid things heading in and out. Two cruise ships, approximately the size of aircraft carriers, were headed outbound; a large sportfish towing its tender barreled past on our port side; two sailboats bobbed almost motionless in front of us; and then to top it off a small outboard-powered skiff dawdled off our bow blocking our path for any maneuvering….it was the first time that Rick made use of our very loud ship’s horn to warn a small craft we were about to run over them. Nonetheless we were able to weave our way through all of that chaos and into the Pier 66 Marina for an uneventful docking. Ghost Rider got a well-deserved wash down, as did we, and we called it a day. We had a list of “boat business” things that required attention, but more impactfully the weather forecast for the next few days looked lousy, with a cold front bringing a squall line and stiff winds. So we decided to just hang out at Pier 66 Marina for a couple of days, and that gave us some time to tend to some more “boat business” items. First we did another water leak check on and under the foredeck with Chelle wielding a pressurized hose above, and Rick down below checking for leaks and drips. 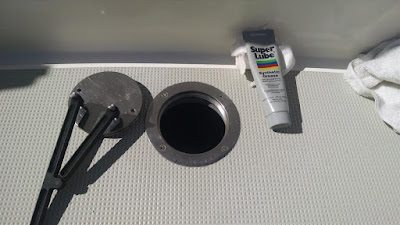 The only ones we could find were a couple of the aforementioned deck bolts, so we removed those, cleaned them and re-bedded them snugly with the Rescue Bond XL1 Pro caulk. Another leak check the next day confirmed we had no more leaks from that deck area at least. 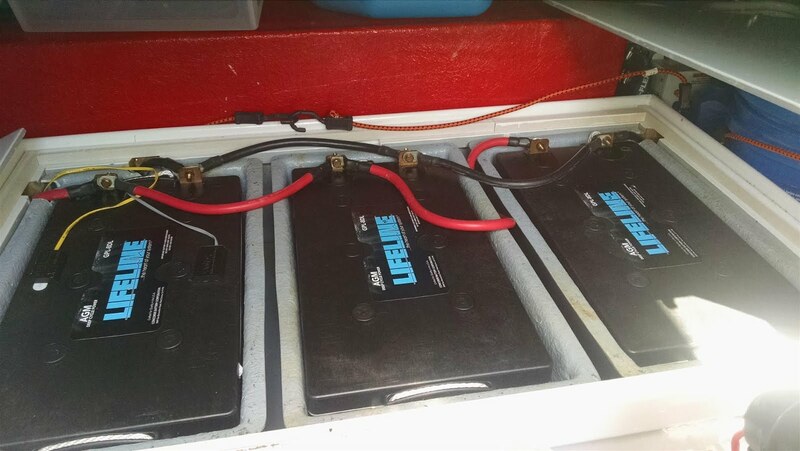 Next up was a drawdown test of the house batteries to assess the apparent low voltage condition we had witnessed after a night of inverting from batteries while at anchor. Essentially we simulated the same type of anchorage conditions while at the dock – removing shore power and powering up minimal equipment. Thankfully the cold front that passed overnight and strong northwest winds that followed kept the boat comfy without the A/C being active. Every hour over a period of 6 hours Rick recorded the key data points: DC draws, AC draws, SOC and voltage at the LinkPro, then manual multimeter readings of battery voltages directly at each of the six house batts, along with battery temperature. The other two main issues, although still relatively minor, included a reappearance of the oil drip from the main engine’s oil pan gasket (forward end only), and similarly a return of the grease seepage from the bottom of the stabilizer hydraulic pump, and a new (currently just nuisance level) hydraulic leak on the starboard stabilizer actuator assembly. Rick was tired of dealing with these, so we phoned our friends at Yacht Tech in North Palm Beach and told them we were headed their way to turn those problems over to them. Thus NPB is our new interim destination while we wait on our window to cross over to the Bahamas. Departure and arrival point forecasts were just about identical – sunny, low 70’s, with winds down to 10-15K inland, but with gale warnings and 5 foot seas just off the coast. Thus, we figured it was a good day to cruise up the ICW to Palm Beach, even though that meant dealing with 21 bridges, 14 of which we would have to wait on openings. That could make the short 45 mile journey a good deal longer than the six hours the nav computer calculated, so we departed FLL at around 0900 and hoped the crazy boaters stayed away from us. The inland waterway was mostly just plain whacky….big boats that did not know how to time a bridge opening, small boats that had no clue they were sharing a navigation channel and couldn’t judge bridge heights, and sailboats that thought they had the right-of-way even when they were under power. Most with port-of-call registrations well north of Florida. It was a circus. Rick manned the helm most of the day from the fly bridge….although not because of pleasant weather – it was freakin’ cold up there with 15-20K winds from the north, but when combined with our forward speeds much closer to 25K, and with temps in the 60’s. But the better visibility and subsequent ease of maneuverability trumped the environmentals. Chelle camped out in the pilot house helm chair to control the wing engine when needed for providing hydraulics to power the thrusters – which was often required as we waited on bridge openings in brisk currents and winds – and to relay or confirm upcoming bridge information. We would have much preferred to be offshore, but knew we would have been just as disappointed with the ride conditions out there. It was a trade-off. At any rate, we made North Palm Beach and Old Port Cove Marina around 1715, an 8+ hour sortie for the day, normally quite acceptable, but lousy time for such a relatively short leg. We got the boat and ourselves cleaned up, enjoyed hot shrimp gumbo for dinner and then crashed into our lounge chairs. 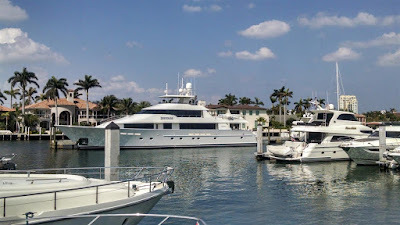 We’ll be hanging out in the Palm Beach area for about 10 days….it will take a while to line up the needed Yacht Tech resources and a visit from Stabilized Marine (the folks who service Naiad stabilizers), plus we have one more trip to make back to Fort Myers (via rental car) for some administrative stuff. More on all of that later. ** What is 100 MPH Tape? The commercial version of it is generally called duct tape, but back in WWII the U.S. Army had Johnson & Johnson manufacture the original version to milspec. It’s like duct tape, but is olive drab in color and its weave it much tighter, plus its adhesive is stronger, and is waterproof…not the stuff you find at Home Depot. The slang “100 MPH” tape came about because American GI’s swore it could hold broken parts on a Jeep together even when going 100 miles per hour. You can also place it on a fabric tear, heat it (like with a clothes iron) and the stuff will stick for years. ** What's a WOT (wide open throttle) run? The main propulsion engines on long distance trawlers, especially with Nordhavns, are continuous duty diesels (most, like ours, are Lugger brand, marinized by Northern Lights), designed for service lives in excess of 25,000 hours. But normal cruising is typically done at low RPMs and therefor, low loads....and these diesels don't particularly care for that. Carbon soot can build up in the cylinders, plus it will shorten oil life. So the standard practice is, once every day, to throttle up to max RPM and run it wide open for a period of 7-10 minutes to blow out whatever may have accumulated. We think of it like a thoroughbred horse that's been trotting for too long and just needs to enjoy a healthy sprint. Plus it turns out to be a great time to examine certain health metrics about the engine and fuel system....such as exhaust gas temperature (EGT), turbo boost pressure, various on-engine heat gun readings, and the fuel system's (Racor) vacuum gauge reading. Great blog, glad all is going well. Still doing desert runs with Baja and loving it. Harry…thanks for following along, glad Baja fun continues to go well. Great Blog. We enjoy reading about your trials and tribulations. Where can I get a roll of 100 mph tape? It would come in handy on our camping trips.